1 July - Roman Shrine Found at Rutland Water Nature Reserve (BBC News). A Roman-era shrine found in Rutland, England, dating to about 100 AD included the burial of a middle-aged man in the center along with possible sacrificial cattle and sheep. July - CSI: Italian Renaissance (Smithsonian Magazine). This article profiles the work of Gino Fornaciari. His work is largely on Medieval Italian remains, but the entire article is worth a read. His findings over the years are truly amazing! 5 July - Danish Archaeologists Discover Ancient Killing Fields in the Ukraine (Eurekalert and PastHorizons). At the Greek colonial site of Chersonesos, skeletons from the 3rd century BC seem to indicate a military invasion that killed a large proportion of the population. 6 July - Il Tesoro di Gabii, sulla via Prenestina Torna Alla Luce una Magnifica Villa Patrizia (La Repubblica). A short piece on the archaeological site of Gabii just outside of Rome, which my former advisor, Nic Terrenato, is excavating. There is a brief mention of some of the tombs found at the site (some of which I've examined). 10 July - Possible New Roman Settlement Unearthed in Derby (ITV.com). This four-sentence brief mentions the discovery of a partial skeleton, likely dating to the Roman period, in Derby, England. 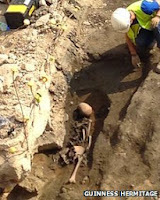 17 July - Corinium's Dead - Excavating Cirencester's Tetbury Road Roman Cemetery (Current Archaeology). This nice article reports on the 100+ skeletons uncovered at Roman Cirencester in the past half century and what their bones and artifacts are telling us about the inhabitants. 24 July - Roman Cemetery Unearthed in Abdoun (Ammon News). At least 12 burials dating back to Roman times were recently found in Abdoun (Amman), Jordan. 31 July - Roman Skeletons Discovered in Gloucester (BBC News). Not much in the way of reporting on this one yet; hopefully we'll get more details soon, as this cemetery found outside of Gloucester is being heralded as "one of the most significant finds in the city in the past 30 years." It's unclear how many skeletons have been recovered (in addition to the 40 or so found decades ago) and how many have yet to be excavated. 2 July - How X-rays Demystified a 2,500-year-old Battle Wound (LiveScience). 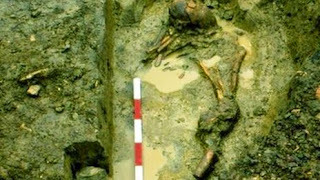 This find was reported a couple months ago (see RBC XXIX), but one of the scientists who took part in the analysis of this ancient Greek skeleton wrote a bit more about it. There are now pictures as well. 8 July - N. Searcy et al., Parasitism of the Zweeloo Woman: Dicrocoeliasis evidenced in a Roman-period bog mummy. International Journal of Palaeopathology. 26 July - This year's Day of Archaeology has a number of entries tagged with Roman and/or Osteology, so click through and check them all out while you're waiting for next month's Roman Bioarch Carnival!